In the spring of 2015, after leaving a leadership conference, I was struck by how many of us have chased leadership without great success. My mind turned to thinking about the immense amount of power that followers and volunteers have to change the world. Feeling driven to help people become the hero they were created to be I started to write my first book, The Power of Following. We all have the power to choose where we want to go and who we can follow to get there. Followers are those who are responsible for taking others visions and making them a reality. I am excited to share the 12 Keys of Following with the world in hopes that we can all move forward in writing our great story. Enjoy by paperback, Kindle or Audiobook. A Window of Opportunity. Sounds simple. Something we all have wished for. I was struck by this and couldn't get passed the questions, "Do we really need one?" and "Do we know what one looks like?". Just releases is a short and to the point ebook to very simply help you cut thru the chatter and answer these two questions. Well worth the price of a cup of coffee. 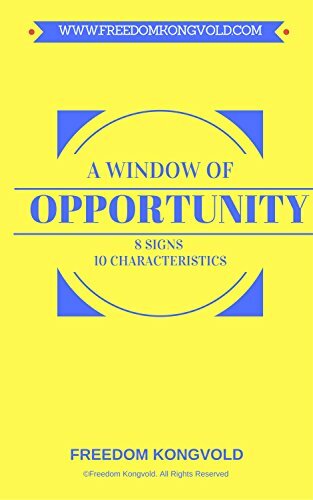 A FREE download is also available by joining the Opportunity List Here.